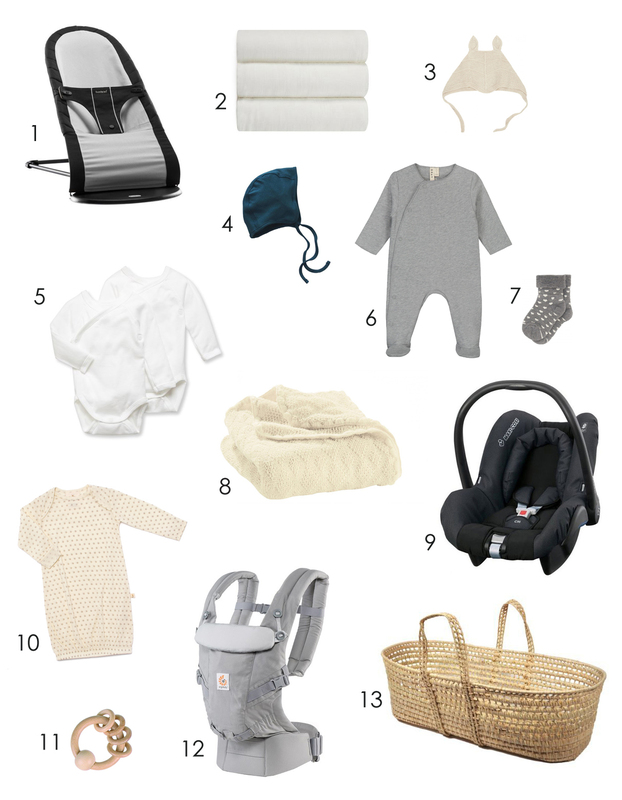 I’ve had several friends reach out over the years asking for my no-fuss, must-buy list of newborn essentials. I remember one of my best friends from college sent me an email asking me for a list of things she should buy as well as a list of things she should not. I loved that she knew there would be all sorts of non-essential baby products flogged at her (umm… baby wipes warmers! ), and she wanted to know what to avoid. Smart mama. 2. White muslin bamboo swaddles from Aden + Anais (and see other swaddle suggestions here). 3. A cosy knitted baby hat (with ears! too sweet!) from Elias & Grace (or this adorable bear hat from Ellie Sunday). 4. An organic cotton, nicely fitted baby bonnet from Mabo. 5. White, cotton crossover bodysuits from Petit Bateau (the ones from Sweetcase are great too). The cross-over snap style means you don’t have to struggle with pulling a body suit over your baby’s head. I always found these to be the easiest ones to put on. 6. Soft, organic cotton long-sleeved bodysuits from Gray Label (and also from Mabo). 7. Socks to keep little feet warm (I have found the thicker ones like this stay on better than the thinner cotton ones). 8. A cosy, more substantial blanket like this organic merino wool baby blanket from Mama Owl (or this one from Babe & Tess or this Bobble Knitted Blanket from Miou made from baby alpaca). 9. An infant carseat — I have always used the Maxi Cosi bucket seat. With attachments, it also fit onto my Bugaboo buggy. 10. All of my babies spent their first few weeks in nightgowns like this one from Chasing Windmills with an elasticated bottom. It makes all those midnight nappy changes so much easier than fiddling around with snaps. 11. Okay, it’s not an essential. But it’s cute and it won’t be long before your baby is able to grab hold of sweet little rattles like this one from Brimful. 12. A baby carrier! I have always liked the Ergo Baby carriers for newborns and the Tula Carriers for toddlers. 13. A moses basket and natural mattress (although, if I’m really honest, our moses basket usually sits empty and collects dust or laundry because our babies always end up sleeping in bed with us!). But still, it’s nice to have a pretty and portable place to lie your baby down to sleep. 14. A baby changing mat — I have always used a wedge-shaped mat because the shape helps to keep wriggly little babes in place, and it’s nice and thick and supportive. You’ll also need a removable washable cover. 15. A buggy (or stroller) — we loved our Bugaboo Frog (the first Bugaboo, most similar to the current Cameleon!) and used the same one for all four babies. We gave it away to the charity shop when we left London, so I’ll need a new one for this baby. I’ve got my eye on the Bugaboo Bee. 16. If you’re planning on bottle feeding or supplementing your breastfeeding, you’ll also need bottles and accessories. 17. All of my babies used a dummy (pacifier) for the first couple years of their lives. This might not be an essential for all newborns, but it was for mine. 18. And lastly, if buying things individually is not for you, there are some newborn sets and services which are a good option. The layette bundle from Mabo is so sweet, Mori has great bundle sets including a hospital bag essentials set, and of course Sweetcase has suitcases filled with beautiful newborn essentials. I think that’s it (hope I’m not forgetting something). Please feel free to add any newborn items you’ve particularly loved as I’m sure other parents would love to hear. Forget the Moses basket… Like you said it mostly collected dust in my house too. For my second child I invested in a Cocoonababy. It was without doubt the best bit of baby equipment I ever purchased. Lightweight, ergonomic and easily transported. My daughter loved it. I was able to take it anywhere – particularly when I visitwd friends and family. It allowed me to put her down anyplace anytime to snooze. She even spent New Years Eve on the floor of my sisters utility room in it whilst I got to enjoy a peaceful dinner. I’m so passionate about it that I’ve recommended it to all my friends and they’ve enjoyed a similar experience. Thank you for posting this Courtney! With our second we loved the merino-silk blend stretchy trousers by Cosilana. When your baby is small there are fold overs that cover the feet and shorten the leg length and later you fold that pocket back and have longer pants so they fit for months and months. The merino-silk blend means they are temperature regulating and perfect any season and they can go on a handwash/wool setting in the machin (I accidentally mixed them into a regular warm wash a couple times and they survived intact too). My little one was in them constantly for the first 9 months. Hi Courtney. When Marlowe was born, I remember seeing a picture of her in the Bjorn Baby bouncer. You had placed a sheepskin liner on it and I remember thinking how cosy it looked for the little one! Would you be able to let me know where you got this from? Did you ever use it in her moses basket? Many congratulations on your exciting news. I gave birth to my second daughter 4 weeks ago – its a wonderful time! Oh congratulations on your second baby girl! What a wonderful, magical time. Yes — I had a sheepskin liner in my Baby Bjorn chair, which I had had for years. I can’t remember where I bought it — I think it might have been from an Eco shop in Notting Hill which no longer exists. I’m so bummed I gave it away before we left London because it might be challenging to find another one. I’ll have a look online now and see if I find anything. I’ll let you know! Thanks for the comment and enjoy this wonderful time with your baby. Thanks so much! Enjoy Christmas in your new home Courtney! Thanks Esther – great idea! Hi everyone, thanks for all this! I read it at the perfect time — so so useful. One question: what about baths? Do you use baby tub? Thanks in advance! I discovered the NZ baby bounce mesh Bouncinette(simple wire structure and cotton mesh, narural look) when living in Australia, great in the heat and with sheepskin on top great in winter too and easy cleaning and storage, and babies love to bounce in it! !